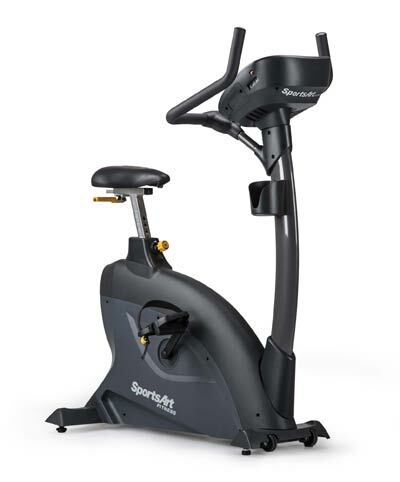 The SportsArt C535U is a heavy-duty upright bike designed for light-commercial use. It has a compact construction and a superior user weight capacity, similar to the BodyCraft U1000g. Its resistance system is self-generating so it does not require an external power source. 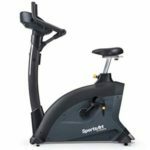 It’s not exactly one of the newest upright bikes; it was released in 2014 but it’s still available and still one of the top-quality exercise bikes. The SportsArt C535U upright exercise bike features a heavy-duty steel frame; it’s designed to support users up to 400 lbs (181.8 kg) which is quite impressive for an upright bike. Most of the base frame of the unit is concealed by several durable ABS covers. However, all the steel tubes in the machine’s construction are coated with an abrasion-resistant and corrosion-resistant powder coating finish. The color used is gray for most of the frame, with the exception of the seat post. The bike has a pretty heavy construction. With all the parts assembled, it weighs over 125 lbs (57 kg) which is more than three times the weight of the average road bike. All this weight considerably improves the unit’s stability. Plus, both its bases are equipped with adjustable levelers. The front base of the bike has a set of caster wheels. Therefore, if you need to relocate it once you have finished your workout, these considerably facilitate the task. The bike’s frame does not fold in any way, though. The fully set up bike is a bit larger than the average upright bike made for home use, such as the Tunturi B35, for example. However, it’s far from being a super-large fitness machine. Its footprint is approx. 45″L x 23″W (155 x 58 cm), while its highest point is given by the top of the console which stands at approx. 56″ (143 cm) above floor level. It is recommended, though, to leave at least two feet of clearance all around the unit for safe operation and access. 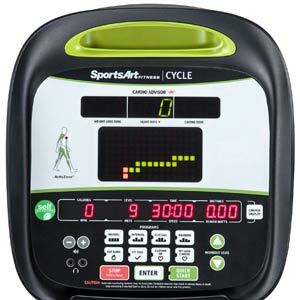 Last but not least, the SportsArt C535U upright cycle does not have a step-through design. However, the front part of the frame is considerably lower which makes it easier to pass over and assume a correct position on the seat. The SportsArt C535U is equipped with a 4-way adjustable (up, down, forward, backward) seat. Its upright post offers plenty of adjustment positions to accommodate users up to 6’5″ (196 cm). Also, the horizontal slider provides several inches of adjustment in order to give you the possibility to achieve a perfect position in relation to the handlebar. The included saddle does not have air cell cushioning; it’s pretty much a standard saddle with a high-density, flexible and contoured top. The seat post is finished with a triangular plate to which the saddle attaches via three bolts. Although it’s not a super-cushioned seat, it still is considerably wider than the average seats on most spin bikes, so we can say that it’s built to deliver optimal comfort. The upright bar of the seat adjusts via a pop-pin while the horizontal slider position is adjusted via the handle placed at its rear. Horizontal adjustments can be done while you are seated. The bike’s handlebar is non-adjustable. It attaches to the short bar fixed bar via four screws which provide excellent, sturdy connection. The handlebar assembly has a multi-grip design and is fully covered by a layer of rubber-foam material to provide a secure grip. There are no pulse sensors built-in the bike’s handlebar, but the console is compatible with all Polar wireless HR chest straps. As we’ve mentioned above, the SportsArt Fitness C535U upright exercise bike is equipped with a self-powered eddy current resistance system. This means you don’t need to connect the bike to an electrical outlet; it produces itself the energy required to power up the console and to control the internal brake. It also has an internal 12V battery which stores some of the energy produced during your workout sessions in order to power up the console. The resistance can only be adjusted from the bike’s console. It’s also automatic; in other words, if you use certain programs, the bike will auto-adjust the resistance. The internal resistance elements are a servo motor and a set of magnets built-in the flywheel. As you select a certain level of resistance from the console, the motor will adjust the pull of the magnets which ultimately increases or decreases the pedaling difficulty. The bike’s resistance system excels in micro-adjustability; it offers 40 levels of resistance. The first few levels are very light, great for anyone who needs recovery training. Conversely, the 38-40 levels offer quite a bit of difficulty, simulating a hill climb and giving you the possibility to achieve a high cardio rate in a short period of time. The weight of the internal flywheel is not specified. However, it has a balanced construction and delivers a very smooth pedaling motion. It’s also bi-directional. Therefore, you can diversify your workouts by pedaling in reverse. Like most other upright bikes with a magnetic resistance system, the C535U features a belt drivetrain. This means you don’t have to take apart the covers in order to lubricate the bike’s transmission. Also, the belt drive system renders the usage of the bike almost completely silent. Finally, the bike’s crankset features heavy-duty crank arms and large, weighted pedals. 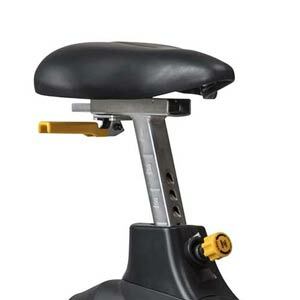 However, since it’s not a spin bike, it is not made for pedaling while standing up. Therefore, even if you’re not a heavy user and the crank arms/pedals can support you with no problem, standing up while pedaling is not recommended. This upright exercise bike features a LED display console. It actually has three display sections. The top display is the cardio advisor. It indicates your heart rate, the weight loss zone, and the cardio zone. The center larger display shows the profiles of the workout program. The bottom display shows the full range of other workout metrics, including calories burned, RPM, the current resistance level, mets, time, speed, distance, and watts. The speed and distance can be set to metric units or imperial units. However, in order to benefit from a heart rate reading, you will need a wireless HR chest strap (the console works with all Polar transmitters) because the bike’s handlebars do not have any pulse sensors. The wireless HR chest strap is not included with the bike. The bike has 10 built-in workout programs. Nine of them have their own quick access key on the console. The programs are Quick Start, Manual, Interval, Plateau, Random, Fat Burn, Fit Test, Custom HR, WT Loss, and Cardio. The WT Loss and Cardio programs share the same program button. The Quick Start program allows you to just exercise without any requirements pedaling and adjusting the resistance as you like, while the console displays track your workout data. The Manual program is similar to the Quick Start program but gives you the possibility to select goals for time, distance, and calories. The Interval program has 3 settings. These are 1:1, 1:2, and 1:3. For the 1:1 setting, the default “work” and “rest” intervals are 1 minute. For the other ones, the “work” interval is also set to 1 minute, but the “rest” intervals are 2 minutes, and respectively 3 minutes. The resistance and interval durations are customizable, though. The Plateau program offers a workout with a gradually increasing resistance for 20% of the workout, followed by a constant resistance level for 60% of the workout, and ends with a gradual resistance decreasing for the rest of the 20% of the workout. The Random program, as its name suggests, generates a random set of resistance profiles every time you press it. Fat Burn is a program designed to help you burn calories. It has 20 levels from which you can select one that corresponds to your fitness level. The Fit Test program is divided into 4 segments of 3 minutes; it will compare the actual Watts and the preset Watts in each segment and adjust the resistance accordingly. Finally, the Custom HR is a heart rate control program which allows you to set your own target heart rate; WT Loss is also an HR control program but designed to keep you at the optimum rate for losing weight; Cardio is an HR control program designed for cardio conditioning. The bike’s console has Bluetooth connectivity. Therefore, you can sync it with your smartphone or tablet via the SA WELL+ app in order to track your progress online. It also has 2 USB ports for charging your phone, or for transferring your workout data manually to your SA WELL+ account, via USB flash drive. In terms of other features, the machine’s console has volume controls for iOS devices and a tablet holder placed under the main keypad. The bikes main body comes pre-assembled. All the drive and resistance parts, as well as the seat post, are already attached to the main frame. 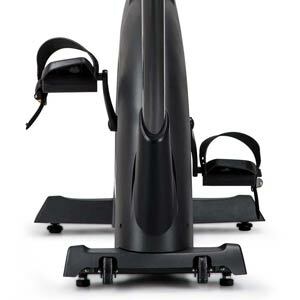 Therefore, you only need to attach the rear bottom base, the saddle, the console mast, the handlebar, the console, the pedals, and several other small covers. This may take up to an hour of your time. However, the manual provides very clear assembly instructions so the task is not too complicated. Also, all the tools required for assembly are included. Maintenance doesn’t require much. Basically, you only have to check for loose bolts and parts and keep the unit clean. An HR chest strap is not included. 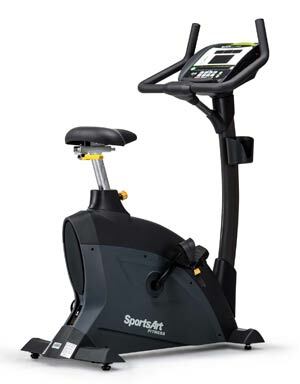 The SportsArt C535U is a light-commercial heavy-duty upright bike. It features a self-generating eddy current resistance system with 40 available tension levels. It includes a LED display console which tracks all the important workout metrics, has Bluetooth connectivity and 10 built-in workout programs (some of them with multiple levels). It’s an excellent exercise bike for users of all levels, for light to intense cardio training, weight loss, and stamina development. Since it’s a light-commercial bike, is not exactly cheap but its quality, durability, and included warranty definitely match its price.